If you could use a little extra fizz in your life, consider investing in a home soda maker. You can have sparkling water anytime without lugging home cases of it and figuring out where to store them. These cutting-edge machines carbonate ordinary tap water by injecting carbon dioxide. The resulting effervescence refreshes the palate, gives cocktails an extra bite and adds class to dinner parties. That pungent, tingling sensation that people crave occurs when CO2 converts to carbonic acid. The acid is actually an irritant that stimulates pain receptors on the tongue, but there’s a surprisingly pleasant outcome. It’s a mystery. The burn going down can bring tears to the eyes, but soda junkies keep coming back for more. Technically speaking, soda makers produce seltzer rather than soda. Seltzer, unlike club soda or tonic water, is carbonated water that contains no additives of any kind. After the initial investment for a machine, sparkling water enthusiasts save money. They also do their part to prevent plastic water bottles from polluting the environment. Soda makers come in a wide variety of designs and price ranges. Here are some of the best. If you’re into colorful, ’50s-style appliances, this is right up your alley. KitchenAid has channeled the design of its classic stand mixers, and reviews are overwhelmingly favorable. This high-quality sparkling beverage maker is constructed of premium die-cast metal. A 60-liter SodaStream CO2 tank and a BPA-free, 1-liter reusable bottle are included. The machine is remarkably simple to use. There’s a snap-lock mechanism to hold the bottle in place, and the carbonation lever is soft-grip for extra comfort. Simply fill the carbonating bottle with water, lock it into place, and pulse the carbonation lever. Using the carbonation gauge, you can customize your fizz. Users appreciate the KitchenAid’s substantial heft. Weighing in at around 20 pounds, it doesn’t tilt or slip around on the countertop while in use. Another perk is that it doesn’t require batteries or electricity. Reviewers also give it high marks for its good looks and perfect compatibility with their KitchenAid mixers, blenders and food processors. In addition to onyx black, contour silver and plain white, eye-popping color options include apple green, aqua sky, empire red, cobalt blue and tangerine. There have been some complaints about the noise level during operation. It’s also a sizable machine, and some customers get it home only to discover that it doesn’t fit under their kitchen cabinets. It’s true that this product is more expensive than others, but its top-of-the-line quality justifies the price and saves money in the long run. KitchenAid KSS1121CU models are designed, engineered and assembled in Greenville, Ohio. The brand has been around for 100 years, so you can expect superior craftsmanship and durability. The product is backed by a two-year warranty. Swedish products are known for their sleek designs and functionality. This soda maker, the slimmest and most compact in the world, is no exception. It’s great-looking, extremely lightweight and high-performing. “Aarke” means “everyday” in Southern Sami, a rare sublanguage of Swedish. Pleased customers say that the name is fitting; the gadget is easy to operate and gets enough use to pay for itself within a few months. Aarke is a division of AGA Marvel, a maker of large kitchen appliances. Since Aarke manufactures only soda makers, you can count on superb engineering and extraordinary attention to detail. Even the packaging can stand up to lots of abuse. 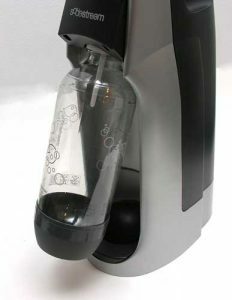 The kit includes the soda maker and a 14.5-ounce PET plastic bottle. It does not come with CO2 canisters, and Aarke doesn’t manufacture them. Aarke recommends SodaStream 60-liter cylinders, which are easily refilled or exchanged. Buying an extra cylinder and a couple of extra PET bottles is probably worth it for the convenience. The maker suggests filling and refrigerating the water bottles beforehand. Cold water takes the CO2 better. To use the Carbonator II, load the CO2 canister into the machine. Tightly screw the bottle to the canister nozzle. You’ll see the CO2 release into the bottle when you pull down the handle. You’ll hear a little belch when it’s finished. The initial carbonation process takes no more than two seconds. If you want a few more bubbles in your water, pull down the handle a couple of extra times. It’s just that easy. Neither batteries nor electricity is required. The Carbonator II is made almost entirely of stainless steel, so it’s naturally rust-resistant. Finishes include stainless steel, brass, matte black or white. By all accounts, operation is quiet. A few users expected a little more carbonization. Having to buy CO2 separately is also a downside, but performance and customer service reviews are overwhelmingly positive. The Carbonator II comes with a two-year warranty. Since not all consumers stick with water, the Drinkmate is giving competitors a run for their money. This machine is designed to carbonate juice, tea, coffee, lemonade, energy drinks, wine and just about any other beverage you’d prefer bubbly. Turning out tasty cocktails or mocktails at home has never been easier. The Drinkmate outweighs the Aarke by a couple of pounds, but it’s still a compact appliance. The maker offers a hand-held spritzer for outdoor fun as well. This affordable soda maker is constructed of BPA-free plastic in black, white or red. The set includes a 1-liter reusable carbonating bottle, a 10-liter starter CO2 carbonator, and a Fizz Infuser. The gadget runs without batteries or electricity. The full-size CO2 cylinders are not included. 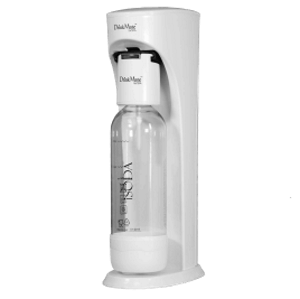 You can purchase them from either Drinkmate or SodaStream. The patented infuser has a unique carbonation preserving cap in case you want to save your drink. It’s detachable, so cleanup is a snap. To use the Drinkmate, remove the back panel. Screw in the CO2 cylinder. Pour the beverage you want carbonated into the plastic bottle. The bottle is clearly marked for different levels of fizz. The bottle twists into the Fizz Infuser, and the infuser snap-locks to the machine. Carbonate the drink by pushing the button. Three or four short presses should give you high carbonation. There’s a slow-release valve that lowers the foam for easy removal. Just press the button to release the bottle and infuser. You can then twist off the infuser for cleaning. People love the versatility of this product. Drinkmate is one of the few brands designed to carbonate any beverage. However, the maker advises against using it with juices that contain a lot of pulp. Drinkmate has fielded some complaints about the bottle and infuser being difficult to attach and release. Most users say they got the hang of it after a few tries. The Drinkmate comes with a two-year warranty. SodaStream is probably the best-known brand in home carbonators. This award-winning product is popular for ease of use, minimalist design and affordability. It’s designed for water only, but the manufacturer offers a wide selection of syrups for flavoring carbonated water. The Source has undergone a redesign. The carbonating bottle now snaps firmly into place with a single motion. You can monitor the fizz level through a smart LED indicator. The product is made of plastic and is available in black or white. It comes with a 1-liter, BPA-free bottle, which is stored in the back compartment of the gadget for shipping. You have to purchase the 60-liter CO2 canisters separately. The machine doesn’t require batteries or electricity. To use it, just attach the filled water bottle to the machine. It will snap when it’s locked firmly into place. Press down on the block to carbonate. The LED lights indicate heavy, medium or light fizz levels. Stop pressing when you reach your preference. The majority of reviewers are very pleased with the Source and give it high marks. A few wish that the carbonation level was higher, and some grumble that the machine makes a screeching sound when CO2 gas escapes. Others would appreciate a tray for catching spills. Even users who rave about the machine wish that the carbonating bottles were dishwasher-safe. Overall, though, this SodaStream product looks great and gets the job done. There is a limited lifetime warranty. Like with any big purchase, you must do a certain amount of research before choosing a product. With the wide variety of soda makers currently available on the market, it is essential to look at many criteria to find the right one. Here are the 8 most important ones. Broadly speaking, all soda makers can be sorted into one of two categories: soda siphons or soda maker appliances. Soda siphons are small devices attached on top of a bottle that allow you to carbonate the water that is found in the bottle. To do so, it uses a small CO2 cartridge that can be inserted inside the siphon. These have many advantages: lower cost, easy to store and move around, simple to use and generally have a lesser chance of breaking. However, it takes them more time to carbonate water and the process will become laborious if you are an avid consumer of sparkling water. They also allow a lesser degree of control over the level of carbonation you want to put in your drink and even if the cartridges are bought in bulk, you will spend more per liter of soda than with most appliances. Thus, siphons are ideal for casual soda drinkers that don’t indulge in excessive quantities of carbonated water and prefer something simple that can procure them with sparkling water from time to time. Soda machines on the other hand are actual appliances that produce soda. 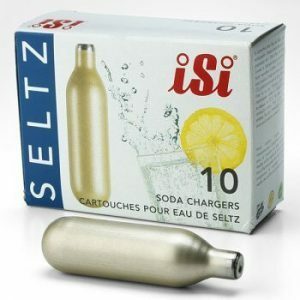 They generally use a carbonator filled with CO2 that is inserted inside the soda maker to provide the fizz to the water in a bottle that is attached to the soda maker. While these have a higher upfront cost, their cost of production per liter of sparkling water is lower than siphons. They are also easier and faster to use and some of them come with features that make them even more efficient or give you a high degree of control over the level of carbonation. However, they are less portable, take up more space and are more likely to have issues. Therefore, they are ideal for people who consume large amounts of soda and need a quick source of carbonated water each time they feel like having some. On top of the fact that there is a myriad of different soda makers, there are also many brands that manufacture these soda makers. While their products differentiate them, it is also important to look at what each brand offers. Some of them, like SodaStream and Cuisinart, have unique refill systems that can be either good or bad. Different brands also have different warranties for their products and different levels of customer service. For more information on the main soda maker brands (siphon brands, machine brands). Another thing that should be an important factor in your decision is other user’s reviews. Most retailers nowadays give buyers the power to leave a review of the products they sell. 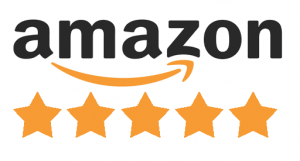 While some of these are short and generally useless, a lot of them, especially on Amazon provide well structured and informative reviews of the issues, shortcomings of the product but also what they enjoyed about it and their overall impression. A general summary of these reviews can be found for each soda maker by going to the review page for it on this site. For example, if multiple people comment on the fact that they had the same issue for a product, you should be wary of the fact that it might happen to you. There are many different types of refilling that exist for soda makers and each of them has its pros and cons. The three most important ones are CO2 cartridges, SodaStream carbonators and manual refills. A more extensive article on the different types of refilling for soda makers. SodaStream carbonators are used by SodaStream and KitchenAid machines to provide fizz to your drink. These are long metallic cylinders that come in 60L and 130L variants (this is the volume of water they can supposedly carbonate). 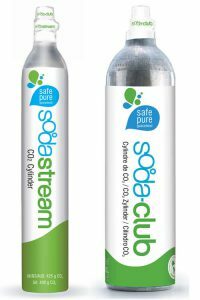 Once your carbonator is empty, you need to go to a participating retail location that exchanges SodaStream carbonators. There they will take your empty carbonator and give you a full one for $14.99 (60L) or $29.99 (130L). Manual refills are methods to refill your CO2 carbonator without using the official methods. Instead of going to a retail location, you can either fill your carbonator with dry ice, switch it for a paintball tank and an adapter or hook up a tank to your soda maker. A complete article with steps detailing these methods of refilling your soda maker. Cartridges are small metal pellets you insert in your soda maker. They must be replaced after every use. Another important factor in your decision should be the soda maker’s construction, i.e. what material it is made of. All soda makers are made of either plastic, metal or a combination of these. The only exception to this is one variant of the SodaStream Source that includes a wood variant. The construction of your soda maker will have a major impact on its quality, durability and aesthetic. In general, soda makers that are made of metal are more solid, durable and look more appealing. Also, when it comes to metal, stainless steel is superior to aluminum when talking about food related applications since it has less of a tendency to react with food which would the affect the flavor. It is also stronger. That being said, aluminum is lighter and less expensive. As for plastic soda makers, they can still get the job done and last for a long time. They are however more likely to break and will feel less sturdy. While nearly all soda siphons need to be screwed onto the bottle, this isn’t the case for soda maker appliances. There are 2 main types of bottle mechanisms that exist: snap-lock and twist-on. Twist-on is the less efficient and harder mechanism that exists. As the name says, it implies twisting the bottle on to the soda maker to attach it. It is also the more common mechanism. Snap-lock is a more efficient and easier to execute mechanism. It implies pushing the bottle into position so that it snaps into place. It is less common and touted as an extra feature. 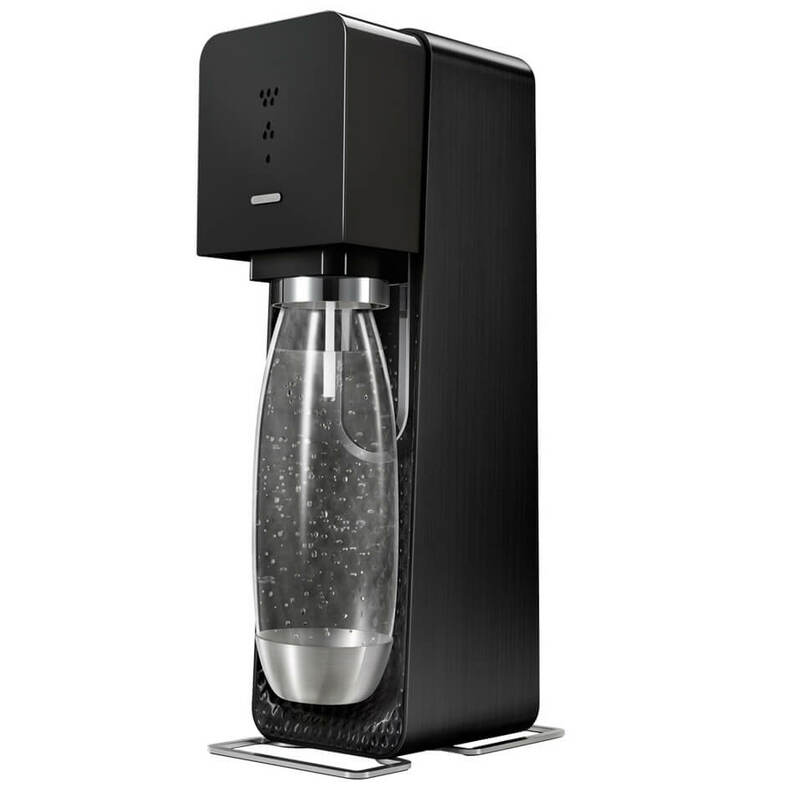 For more casual drinkers, the twist-on mechanism is fine since you won’t be using the soda maker that often therefore the slower mechanism won’t become a major annoyance. However, if you consume a lot of soda, a soda maker with the snap-lock mechanism is recommended so that you do not struggle excessively each time you want soda. $0-$60: All soda siphons (see below) fit into this category. 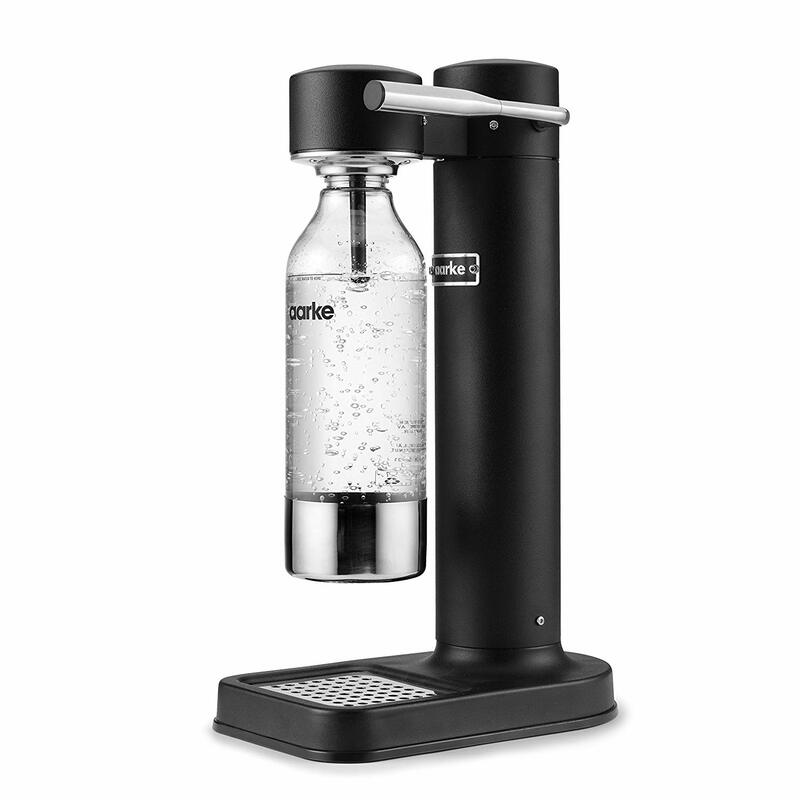 $60-$100: Basic soda makers with no additional features. $100-$180: Mid range soda makers with additional features. $180-$250: Top of the line, high quality soda makers. The ability to control the level of fizz. This one is quite common and most soda makers that require multiple actions from the user to carbonate the drink will have this feature. Buttons to carbonate. Electronic soda makers usually have buttons that will allow you to carbonate your drink and even sometimes choose the level of fizz by simply pressing one button. Glass carafes. While most soda makers use plastic bottles, 2 SodaStream models use glass carafes instead that are more aesthetically pleasing and dishwasher friendly. Infusing drinks. 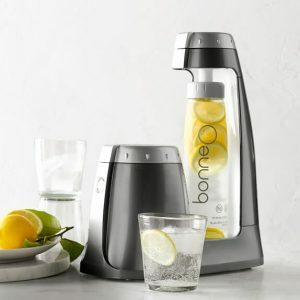 The Bonne O comes with the ability to, on top of carbonating your drink, infuse your drink with the fruits you put in it. 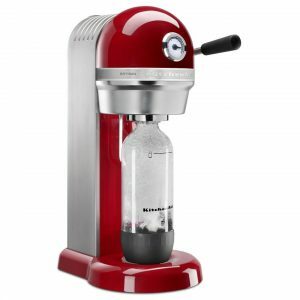 Now that you know everything about soda makers, it’s time to find the perfect soda maker for you.